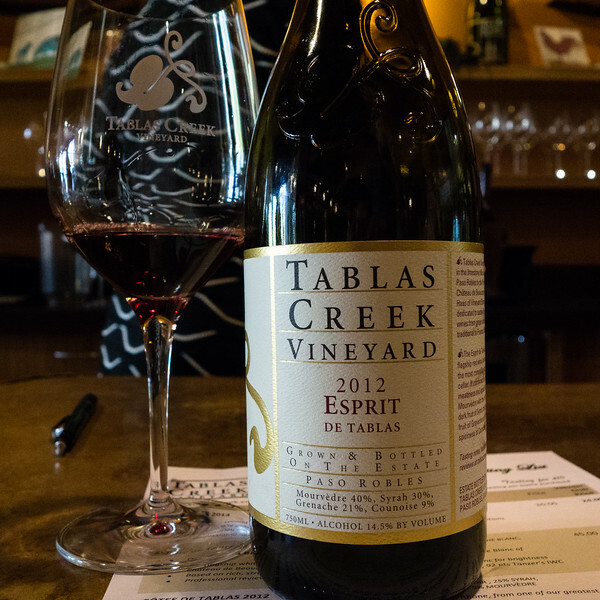 For our second day of wine tasting in California, we visited Tablas Creek Vineyard in Paso Robles. It had a beautiful tasting room, well organized so that tasting groups were spread out and it didn’t feel crowded. There was a $10 tasting fee, with one complimentary tasting per bottle purchased. I didn’t get a photo of all the wines we tasted, so I will just go over those that I have a photo of. Once again, my tasting notes were pretty much all the same – we liked them all – had some favorites. So, I will be sharing info from the tasting sheet. First up the 2011 Esprit Blanc de Tablas, retail $45, club $36. Our flagship white, renamed in 2011, modeled after the Chateauneuf-du-Pape Blanc of Chateau de Beaucastel. Based rich, structured Roussane, with Grenahe Blanc and Picpoul Blanc for brightness. Professional reviews: 90 Galloni. Next up, Grenache Blanc 2012. Retail price $27, club price $21.60. Tasting sheet doesn’t have any notes on it, we said that it was excellent, creamy with subtle apple. 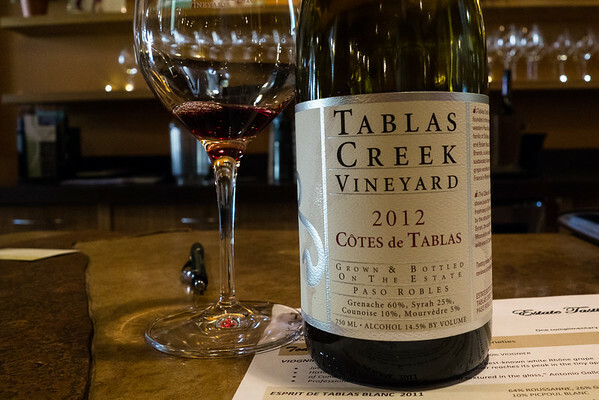 Then, Tableas Creek 2012 Cotes de Tablas. Retail $35, club $28. Our showcse for Grenache, the classic grape of the Southern Rhone, from one of our greatest Grenache vintages. We balance Grenache’s bright spiciness with Syrah’s meatiness, Mourvedre’s earth and structure and Counoise’s wildness. Reminiscent of the classic, built-to-age Grenache-base wines of Gigondas and Vaqueyras. Professional reviews: 92 Galloni, 91-93 Wine Advocate, 91-91 Tanzer’s. 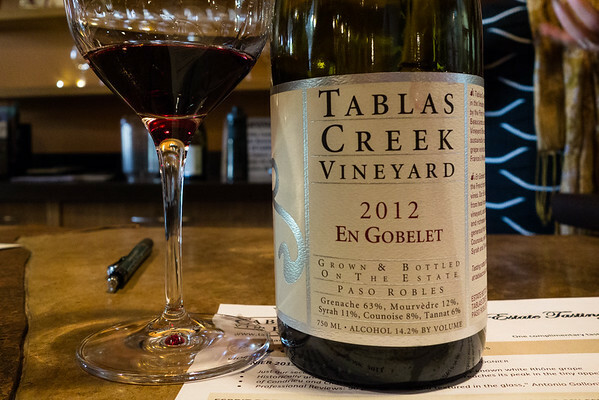 Next, Tablas Creek 2012 En Gobelet – A wine club exclusive. Our blend sourced exclusively from dry-farmed, head-trained vineyard blocks. Prof review: 92-94 Galloni. 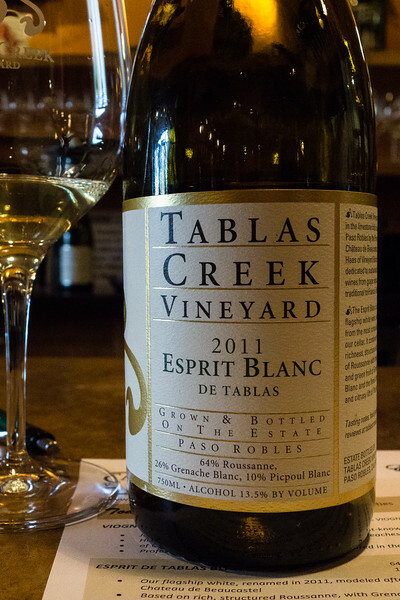 Next, Tablas Creek 2012 Esprit de Tablas, another wine club pick. Our flagship red blend, based on Mourvedre, from a classic California vintage. Prof review: 93-95 Galloni, 92-94 Wine Advocate, 92-93 Tanzer’s I.W.C. 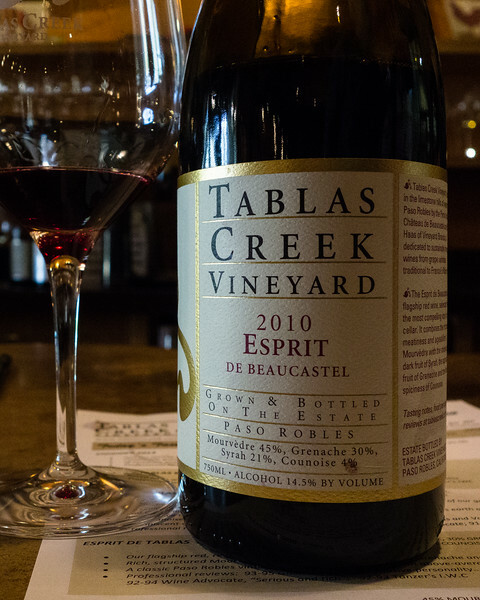 Last, Tablas Creek 2010 Esprit de Beaucastel. Retail $55, Club $44. Our flagship red, modeled after the Chateauneuf-du-Pape of Chateau de Beaucastel. From the cool, refined 2010 vintage – one of our best yet. Prof reviews: 94 Wine Advocate, 93-95 Rhone Report. 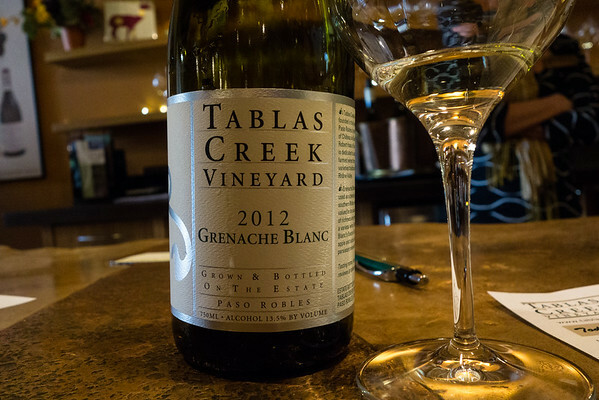 We thoroughly enjoyed our wine tasting at Tablas Creek Vineyards. Our guide, Teri, was very informative and enthusiastic about her job and the wine. She explained about biodynamic planting and even moon planting. It was very interesting and the wine was excellent. Wine tasting is one of my favorite things to do, especially in Northern California!